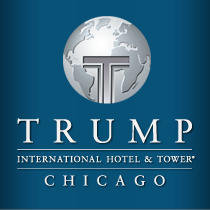 Luxury residences at Trump International Hotel & Tower® Chicago are surrounded by the finest the city has to offer and are intimately connected to its pulse. The tower's premier address in River North means the finest shopping, entertainment, and world-renowned dining opportunities await only steps away. It's exclusive position in the curve of the Chicago River provides views that bring the city's legendary skyline into its 486 condominiums and 339 hotel rooms through floor to ceiling windows. Chicago's business district, the Loop, is immediately south of Trump International Hotel & Tower. As one of the nation's largest centers of business, the Loop is an international hub of culture and commerce. This area of the city is also home to the Theater District, inviting you to enjoy productions of acclaimed Broadway shows and indulge in the some of the finest steakhouses in the midwest. Nearby Michigan Avenue is home to innumerable respected designers, boutique brands, and luxury retailers including Cartier, David Yurman, Tiffany & Co., Hugo Boss, Marc Jacobs, Prada, Cole-Haan and many others. The Magnificent Mile's seemingly limitless shopping include the Gold Coast's Oak Street designer boutiques and salons. Landmark Chicago attractions are readily accessible within a comfortable walking distance or a short drive. Navy Pier, Millennium Park, and the Hancock Observatory offer unique Chicago experiences and The Field Museum, Shedd Aquarium and The Adler Planetarium amaze visitors with their acclaimed exhibits. Travel into and out of Chicago is convenient with O'Hare International and Midway airport only minutes away. To simplify your arrival and departure, as well as any other livery needs, a residential concierge at Trump International Hotel & Tower® Chicago can arrange private car services.